Step off the beaten path and head to Kayaking & Canoeing and Monument Hill War Memorial. Venture out of the city with trips to Fremantle Prison (in Fremantle) and Rockingham Beach (in Rockingham). 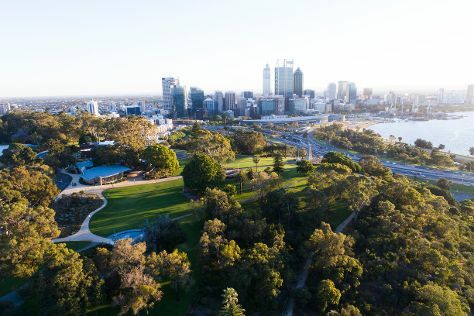 There's more to do: admire the natural beauty at Kings Park & Botanic Garden and contemplate the waterfront views at Swan River. To see maps, traveler tips, and more tourist information, you can read our Perth trip itinerary planner . If you are flying in from United States, the closest major airport is Perth International Airport. In December, daily temperatures in Perth can reach 86°F, while at night they dip to 59°F. Finish up your sightseeing early on the 10th (Tue) so you can travel back home. Rottnest Island is an island off the coast of Western Australia, located 18km west of Fremantle. Start off your visit on the 11th (Wed): explore the activities along Porpoise Bay, enjoy the sand and surf at Salmon Bay, then enjoy the sea views from Wadjemup Lighthouse, and finally explore the gorgeous colors at Cathedral Rocks. Get ready for a full day of sightseeing on the 12th (Thu): get engrossed in the history at Rottnest Island Museum, then contemplate the long history of Salt Store Gallery and Exhibition Centre, then kick back and relax at The Basin, and finally contemplate the waterfront views at Longreach Bay. For more things to do, other places to visit, ratings, and more tourist information, refer to the Rottnest Island trip tool . You can do a combination of ferry and taxi from Perth to Rottnest Island in 1.5 hours. Alternatively, you can ride a ferry; or do a combination of ferry and bus. In December, daily temperatures in Rottnest Island can reach 86°F, while at night they dip to 59°F. On the 13th (Fri), wrap the sightseeing up by early afternoon so you can travel back home.